“Infantino Street” is, as previously noted in these reviews, an homage to Carmine Infantino, the DC Comics artist for many of the Flash’s greatest Silver Age adventures. 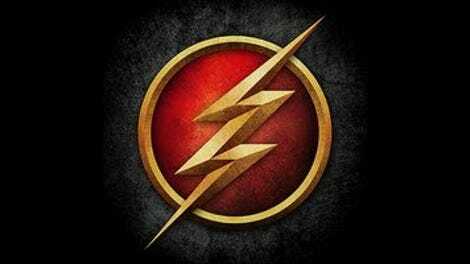 If the creators of the CW version of The Flash really want to pay tribute to Infantino, however, they would do well to sit down with a stack of those classic issues he helped shape over the next few weeks before getting to work on season four. As effective as much of “Infantino Street” is, it’s yet more evidence that The Flash is stuck in a rut, repeating the beats of previous arcs and putting Barry Allen through the tragedy wringer yet again. Maybe it will be different this time; after all, there’s still an episode left to go in the season, and Barry has already demonstrated that he’ll do anything to save Iris, including breaking him own rule against traveling back in time. Even though I rolled my eyes when suddenly Barry was back in the Siberia of 1892, I’ve decided to give him a pass on this one. First of all, the person he’s gone to pluck out of the past doesn’t belong there either, so the sanctity of the time-space continuum has already been broken. In this case, two wrongs do make a right. Secondly, the person he’s there to get is Captain Cold, and any excuse to have him back on The Flash is good enough for me. Granted, I have no idea how Barry knew when and where to find him, but why worry about it? The reason he needs Snart is that the only power source strong enough to fire up the Speed Force Bazooka is locked away in an ARGUS facility, and Lyla doesn’t trust Barry with it after that whole “turning her baby girl into a boy” thing. Using HR’s face-switching tech, Barry disguises himself as Lyla to bring Snart into the facility as his prisoner. It would have worked, too, if only he’d known the proper counter-phrase to use in response to “Elvis Banana,” but instead he has to beat up the guards (which sets off no red flags in the rest of the facility, but fine). 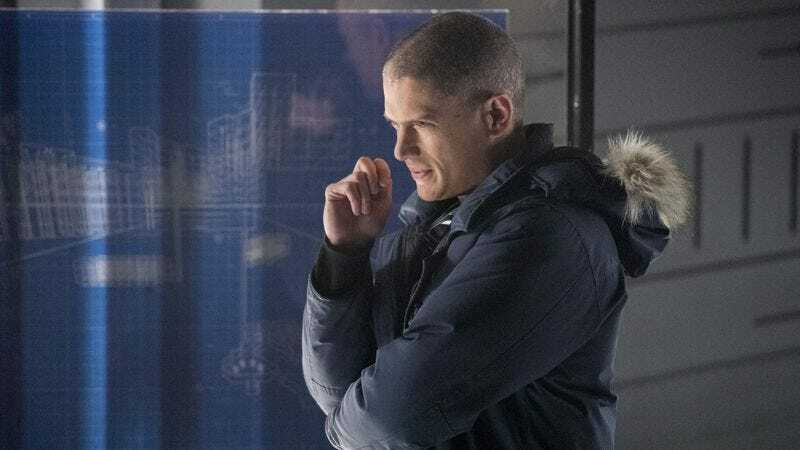 Wentworth Miller gets to chomp deep into the scenery again, which must come as a great relief following the torpid Prison Break revival, and the chemistry between him and Grant Gustin is enjoyable enough that it’s a shame we don’t get to experience it more often. As much as Snart likes bringing out the bad in Barry, he can’t help but admire his heroic qualities; when Barry appears ready to murder King Shark with the cold gun, Snart suggest simply putting him to sleep instead, When Snart gets trapped in the cell with King Shark, Barry sticks around to save him, even though he knows Snart’s days are numbered. It’s that action that convinces Lyla to trust Barry and give him the power source anyway. All of that stuff is fun, but given that the episode takes place in the 24 hours before Iris is scheduled to die, there’s necessarily a somber tone to the rest of it. There’s an unfortunate sense of Iris waiting around to be saved; she hasn’t had much agency throughout this arc, often relegated to the sidelines while others try to deal with the problem. Is she still going to work? Does she have a bucket list? Can’t she just fly to Paris and hide out until they stop Savitar? Barry doesn’t think that will work, but in his absence Joe, Wally, and Iris breach into Harry’s workshop on Earth-2. It should work, since Barry doesn’t know about it and thus his memories won’t be shared with Savitar, but alas, Evil Barry is too clever and tricks HR into revealing the secret by posing as the present-day Flash. To its credit, the episode does build to a suitably epic climax, with Cisco throwing down in the woods with Killer Frost as Barry attempts to stop Savitar with the bazooka at Infantino Street. Alas, Savitar uses the Philosopher’s Stone to counteract the bazooka, and Barry isn’t fast enough to stop him before he plunges the blade through Iris’ heart. Iris dies in Barry’s arms…unless he figures out how to save her next week. If this is the end of Iris, at least she got one last great scene with Joe as they each confess a secret they’d never told before. Jesse L. Martin gets another chance to show off his pipes as Joe serenades her with “What Does It Take?” Martin and Candice Patton are both terrific in this scene, but I’ll hold off on any final words about Patton and Iris until we see how next week’s finale plays out. As it stands now, however, we have Barry howling in despair over the body of yet another loved one killed by yet another speedster, and that’s a song we’ve heard at least one too many times. Grodd and Cupid are confined to cells right next to King Shark. It would be a shame if no one ever gets around to putting together a new Suicide Squad. “They didn’t show the shark because they couldn’t afford to make it look good.” Wink. Still not feeling anything about HR and Tracy. I’m not up to date on Legends Of Tomorrow, so I really have no idea what Snart’s current status is. Keeping him dead sure would be a mistake, though. It’s bugged me all season long that Cisco has treated HR like crap for no good reason, so it was nice to see him come around and acknowledge his contributions to the team, however tenuous they are.